Kindergarten Story Time Bundle! The Three Little Pigs and Chicken Little! Chicken Little: Worksheets and Activities for Little Learners! The Three Little Pigs to Meet Common Core Standards! 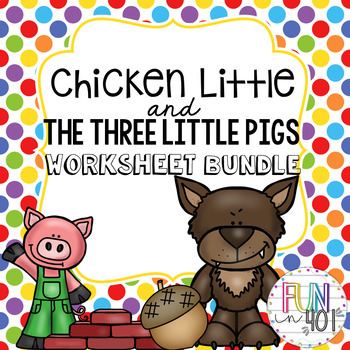 The Three Little Pigs!Included in this packet is 18 pages of activities when reading The 3 Little Pigs and The True Story of the 3 Little Pigs!Character & SettingProblem & SolutionStory OrderGraphingWriting PromptsPlease find the Chicken Little Version, here! This download will give you two of my best selling items! The worksheets will help your little learners understand their stories while teaching them common core skills!